Now that summer holidays have started, kids might want something to snack often. So here I am with a very simple Omapodi recipe which can be prepared easily with ingredients available at home. You do not need much ingredients for making this delicious snack. Moreover every house will be having besan, so no need to go hunting for ingredients. Today we will learn how to make omapodi following this easy recipe with step wise pictures. Before going to the recipe, here is a picture of muruku maker. You have to use the plate with many holes for making omapodi. Grind red chilli, hing and carom seeds together with little water. Filter it and keep it aside. 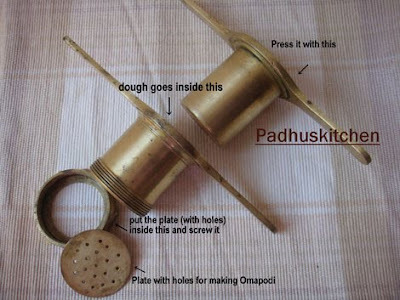 Once you have squeezed enough dough as in picture 3, stop pressing the muruku maker. Fry both sides until golden brown. Can you see bubbles in picture 3. Once it is done, the bubbling noise stops. Omapodi is done. Remove it with a slotted ladle and strain it in a colander. After it cools, store it in an airtight container and enjoy.It has a self life of 10-12 days. 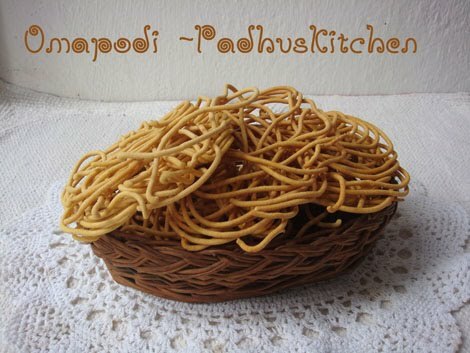 Murukulu / janthikalu, we call them with that name,look so tasty and crispy,surely its a kids delight. Crispy and yummy snack,love this so much. Feel like munching some,my fav omapodi..
superb pictures and lovely post.will try these asap. You are right I already have all the ingredients....now I just need to find a muruku maker! Sounds like a great snack. Crispy and delicious omapodi..Love it! Omapodi looks super crispy and delicious. 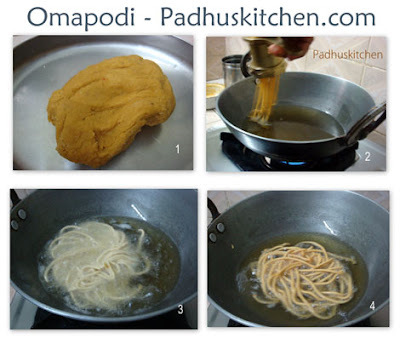 Loved the step by step explanation.Omapodi look so crispy and crunchy. Hey I never made it in this way..Always add red chilli powder. This idea of using the masala water is interesting!! My fav. Looks crispy and crunchy! Crispy and crunchy snack. Lovely. Wow,crispy and tasty snack.Lovely presentation. looks so crunchy and great!! Liked the step by step pictorial..nice work!! Great recipe... So simple and delicious... Lovely pics too, loved the collage!! i'm pathetic when it come to frying it scares my life out! god they look SO good, winner! wow superb... love it so crispy..
How to filter the red chilli ,channa dal,Omam mix? Can we use mixi to grind channa dal,red chilli and omam? You have to make a soft dough. May be you would have added too much water. I tried this recipe today and it came out really well. Thank you. Dry red chillies. When I mention red chilli, it is always dry red chilli only, otherwise I will specifically mention it as fresh ones.